What is postprandial hypotension? Do you sometimes feel dizzy or lightheaded after eating a meal? If so, you could have a common condition called postprandial hypotension (the term loosely translates to low blood pressure after eating) that affects up to one-third of older men and women. Digestion is a complicated job that requires precise coordination between the digestive, nervous, and circulatory systems. An early task is rerouting extra blood to the stomach and small intestine. To compensate for this diversion, the heart beats faster and harder while blood vessels far from the digestive system narrow. These two actions maintain blood pressure and blood flow to the brain, legs, and everywhere in between. In some people, the heart and blood vessels don't respond as they should. That causes blood pressure to decrease everywhere but the digestive system. The sudden drop usually announces itself as dizziness or lightheadedness. Postprandial hypotension causes some people to fall, others to faint. It can trigger the chest pain known as angina, disturb vision, or cause nausea. It has even been reported to trigger the mini-strokes known as transient ischemic attacks. Some people are genetically predisposed to postprandial hypotension. In others, it comes on after a stroke, accident, or other trauma damages key nerves or blood pressure sensors. In most people, though, postprandial hypotension stems from aging-related changes that interfere with the body's ability to respond quickly to sudden changes in blood pressure. A major culprit is high blood pressure, which stiffens arteries, making it harder for them to narrow and relax as needed. 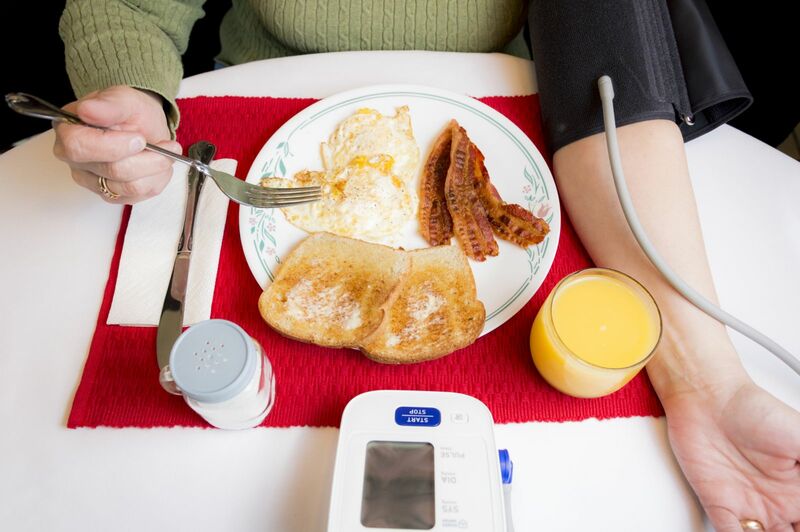 Failure of blood pressure sensors in the arteries or stretch receptors in the stomach (which alert other parts of the body that eating is under way) can lead to postprandial hypotension, as can diabetes, Parkinson's disease, and other nerve-damaging conditions. Water before meals. Drinking 12 to 18 ounces of water 15 minutes before eating can blunt a fall in blood pressure. Smaller meals. Larger meals are more likely to trigger postprandial hypotension than smaller ones. Try switching from three square meals a day to six or seven smaller meals. Fewer rapidly digested carbs. White bread and other foods made with highly refined flour, white rice, potatoes, and sugary beverages pass quickly from the stomach to the small intestine. This rapid transit contributes to postprandial hypotension. Cutting back on these foods in favor of slowly digested whole grains, beans, protein, and healthy oils may keep your blood pressure up after a meal. Easy does it. Blood pressure usually hits bottom 30 to 60 minutes after a meal. Sitting or lying down for an hour or so after eating is another way to cope with postprandial hypotension. If you need to move around, be careful and be alert for signs that your blood pressure is low. Various medications and supplements have been tested against postprandial hypotension. These include caffeine, guar gum (a water-soluble fiber), acarbose (a diabetes drug that slows the digestion of carbohydrates), midodrine (a blood pressure booster), and others. But none of them has performed well in clinical trials, and side effects of these therapies can sometimes be worse than postprandial hypotension. If you often feel odd after eating, tell your doctor. He or she can work with you to see if the feelings are due to postprandial hypotension or something else, and help you find ways to ease the problem.